As your daily life continues to get busier, it can be extremely hard to find any spare time to clean. Less time means less attention to detail, making the easy solution choosing cleaning products that promise a fast and easy clean. And, if you are the one cleaning, we get it; with a direct promise to make your life easier, why would you not choose those types of products? Choosing the easier solution may not be the best answer to your problems, but choosing the right company to help you is. Why? Because we believe in doing everything the green way. 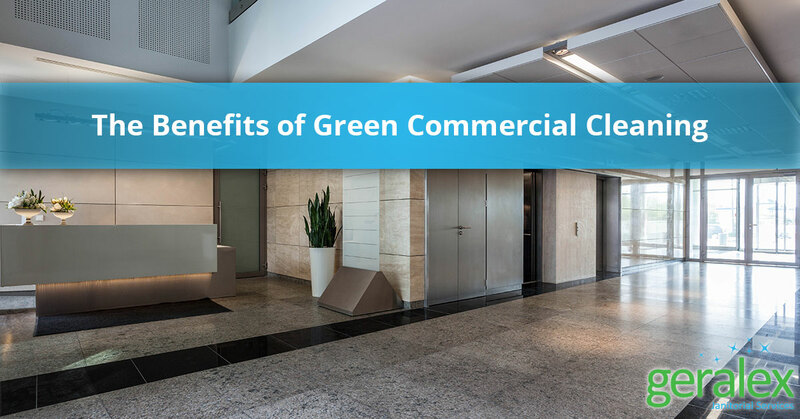 Providing commercial businesses throughout Chicago with green commercial cleaning services, we ensure that your property is not only spotless, but is cleaned in a safe and effective manner. When using traditional cleaners, you are releasing the toxic chemicals into the environment. This is not only harmful to you and all your employees, but to the environment as well. By choosing green products, Geralex Janitorial Services helps to reduce the pollution in the waterways and ozone, minimizing our impact on the world and spreading the word of why green is so much better. Have you ever noticed that bleach-like stench when you walk into a freshly cleaned room? Just like its impact on the environment, using anything but green can affect your well-being negatively. Releasing toxic fumes into the air you breathe, traditional cleaning solutions have been linked to asthma, irritation, and allergies, when exposed to for a long period of time. By “going green’ you will no longer be exposed to harmful chemicals that linger in the air and on surfaces within your commercial building. Safer for both our clients and our staff, cleaning with green products means that no one has to come in contact with toxins. Reducing the chance of chemical burns and eliminating the chance of property damages, green cleaning means that you, and your employees, can feel good about what is being used to make your property spotless. If you’re used to cleaning with your name brand solutions, you may want to pick the bottle up and take a look at the back. Do you know what the ingredients actually are? Yeah, didn’t think so. While you may recognize some of the ingredients in traditional cleaning agents, a majority of them probably seem foreign, and who wants to be subjected to chemicals they know nothing about? Green products, on the other hand, are made of plant-based and eco-friendly solutions, making it easy to know what you are using. Think you’re ready to go green? Good choice. Offering superior commercial cleaning solutions, we believe in making your choice of green easy and affordable, taking the burden of cleaning off your plate, and allowing you to focus on the more important things at a hand like running your business. Find out more about our green cleaning services, and contact us today to ask how to scheduling your commercial cleaning now.